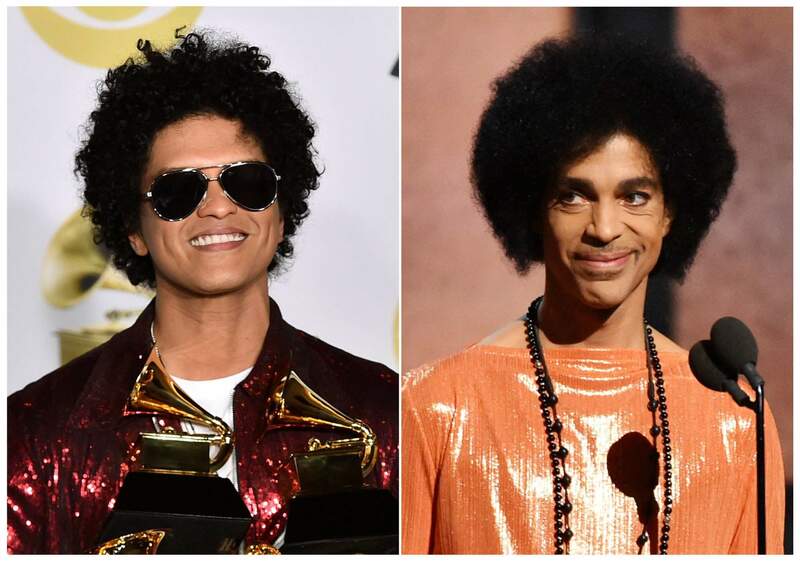 This combination photo shows Bruno Mars in the press room with his awards at the 60th annual Grammy Awards in New York on Jan. 28, left, and Prince presenting the award for album of the year at the 57th annual Grammy Awards in Los Angeles on Feb. 8, 2015. A representative for Mars says a report claiming he will portray Prince in a new movie is false. The Daily Mirror, a British tabloid, published a story over the weekend saying Mars was “being lined up to play Prince” in a biopic to air on Netflix. The story was picked up by several online sites and was circulating widely. But Mars’ representative says the story is not true, and Netflix says there’s no film in development.